Daniel Clowes was born in Chicago in 1961. He is the creator of the comic book Eight-Ball, twenty-one issues of which have been published to date. His work has appeared in Esquire, The New Yorker, Vogue, Time, and Newsweek, among others. A feature film based on his 1998 book, Ghost World, starring Thora Birch, will be released in 2001 by MGM. He lives a childless, petless life in California with his beloved wife. 2000-03-06. New. Ships with Tracking Number! INTERNATIONAL WORLDWIDE Shipping available. Buy with confidence, excellent customer service! 2002-04-04. New. Ships with Tracking Number! INTERNATIONAL WORLDWIDE Shipping available. Buy with confidence, excellent customer service! 2007-05-01. New. Ships with Tracking Number! INTERNATIONAL WORLDWIDE Shipping available. Buy with confidence, excellent customer service! New York: Pantheon, 2000. Promotional Postcard for the Complete Eightball, Signed by Daniel Clowes laid in. First edition / First printing. Illustrated laminated boards. Very fine in a very fine dust jacket. Condition: Very fine in a very fine dust jacket. 2007-05-01. Good. Ships with Tracking Number! INTERNATIONAL WORLDWIDE Shipping available. May not contain Access Codes or Supplements. May be ex-library. Shipping & Handling by region. Buy with confidence, excellent customer service! Public Square Books, 2005-05-25. Paperback. Good. PAPERBACK. 841572487X . New. 2014. La Cupula, 2007-04-23. Tra. Hardcover. Good. Pantheon. Hardcover. 0375406921 New Condition. . New. Pantheon. PAPERBACK. 0375714529 New Condition. . New. New York: Pantheon, 2000. First USA Edition. Fine book in a Fine Dustjacket. Hardcover. Signed by the author on the title page.. Signed by Author. First Edition. Pantheon. Hardcover. 0375406921 Like New Condition. . Fine. Pantheon. PAPERBACK. 0375714529 Like New Condition. . Fine. 2000-03-06. Good. Ships with Tracking Number! INTERNATIONAL WORLDWIDE Shipping available. May not contain Access Codes or Supplements. May be ex-library. Shipping & Handling by region. Buy with confidence, excellent customer service! Jonathan Cape. Paperback. 0224063235 Please allow 4 - 14 business days for Standard shipping, within the US. Thank you for supporting our small, family-owned business! . New. 2007-05-01. Jonathan Cape. Paperback. 0224063235 Please allow 4 - 14 business days for Standard shipping, within the US. Thank you for supporting our small, family-owned business! . Fine. 2007-05-01. Pantheon, 2000-09-12. First Edition. Hardcover. Like New/Very Good. A nice hardcover with a crisp dust jacket, a tight binding and an unmarked text.From a private smoke free collection Shipping within 24 hours, tracking number and delivery Confirmation.First edition, with full number line. Pantheon, 2000-09-12. 1. Hardcover. Used:Good. Pantheon. Paperback. 0375714529 Please allow 4 - 14 business days for Standard shipping, within the US. Thank you for supporting our small, family-owned business! . New. 2002-09-24. Reprint. Pantheon. Paperback. 0375714529 Please allow 4 - 14 business days for Standard shipping, within the US. Thank you for supporting our small, family-owned business! . Fine. 2002-09-24. Reprint. New York: Pantheon Books, 2000. Hardcover. Hardcover with dustjacket. 4to. First edition. Review slip laid in. Book and jacket are in fine condition; from the creator of Eightball and author of Ghost World. 116 pp. 2002-04-04. Good. Ships with Tracking Number! INTERNATIONAL WORLDWIDE Shipping available. May not contain Access Codes or Supplements. May be ex-library. Shipping & Handling by region. Buy with confidence, excellent customer service! New York: Pantheon, 2000. First Edition, First Printing. Hardcover. Fine/fine. Full color and b&w, illustrated endpapers, unmarked. Laminated boards. "David Boring" is a stunning tale from "the country's premier underground cartoonist . . . a master storyteller and artist" ("Newsweek"). It follows a feckless young man of 19 who is obsessed with a drawing of a woman he's clipped from a magazine. But when he actually meets her (at least it "could" be her), things begin to crazily awry. Seller: Books of Aurora, Inc.
Jonathan Cape. Paperback. 0224063235 Please allow 4 - 14 business days for Standard shipping, within the US. Thank you for supporting our small, family-owned business! . Fair. 2007-05-01. Pantheon, 2000-09-12. First Edition. Hardcover. Very Good/Very Good. A nice hardcover graphic novel with a tight binding and an unmarked text.From a private smoke free collection.24 hour shipping with a tracking number and delivery confirmation.First edition, with full number line. Pantheon, 2000-09-12. Hardcover. Like New. First edition, first printing. Very fine, excellent condition. Dust jacket has minor wear. Book is flat, tight and clean. Pantheon. Paperback. 0375714529 Please allow 4 - 14 business days for Standard shipping, within the US. Thank you for supporting our small, family-owned business! . Fair. 2002-09-24. Reprint. Pantheon. PAPERBACK. 0375714529 Please allow 4 - 14 business days for Standard shipping, within the US. Thank you for supporting our small, family-owned business! . Fair. U.S.A.: Pantheon. Hardcover. 0375406921 2000 1st edition crisp tight hardcover very good dust jacket sharp corners withdrawn library . Good. 2000. 1st Edition. Pantheon. PAPERBACK. 0375714529 Special order direct from the distributor . New. Pantheon, 2002-09-24. Reprint. Paperback. Used:Good. Jonathan Cape. PAPERBACK. 0224063235 Brand New ,Original Book , Direct from Source , Express 5-8 Business days worldwide Delivery. . New. Pantheon. PAPERBACK. 0375714529 . New. Pantheon. PAPERBACK. 0375714529 signs of little wear on the cover. . Very Good. Pantheon. PAPERBACK. 0375714529 Minor shelf wear . Very Good. Paperback. New. 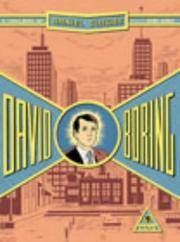 Discover the adventures of David Boring in this electrifying new graphic novel from the author of Ghost WorldDavid Boring is a nineteen-year-old security guard with a tortured inner life and an obsessive nature. Pantheon. PAPERBACK. 0375714529 *LIKE NEW* Ships Same Day or Next! . Fine. Pantheon. PAPERBACK. 0375714529 *BRAND NEW* Ships Same Day or Next! . New. New York:: Pantheon. Paperback. 0375714529 116 pp., 8vo. Paperback. First edition. A comic book from the author of Ghost World. Very light wear to covers. Textblock clean & crisp. . Very Good. 2000.. First edition. Jonathan Cape, 2007-05-01. Paperback. Good.